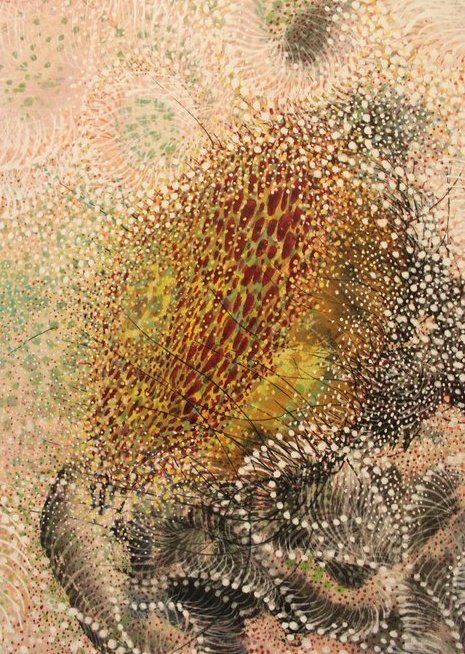 For years, Brenda Louie has literally been painting in circles. Which isn’t to say she’s she’s running in place. In two separate Sacramento-area shows, both featuring a pair of grid-like installations composed of 20 x 22″ watercolors pulled from her 300-painting “Flower Series,” Louie covers heaven and earth and a lot of space in between. Where the artist’s previous foray into circular forms, “The Zero Series,” grappled with death in the form of bloody red-and-black canvases singed by a blowtorch, her recent watercolors ponder the vagaries of the life cycle. 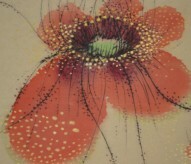 Apart from the phantasmagorical nature of the works themselves, which combine Chinese calligraphic washes and brushstrokes with a kind of loose, biomorphic pointillism, what animates these exhibits is the fact that roughly half the paintings (those from the “Earth” series) are partially obscured by a layer of Mylar. This device renders them nearly opaque. Details are submerged in a gray-pink field of indeterminate depth, leaving only dancing calligraphic gestures that recall fish swarms as much as chrysanthemums, the ostensible subject. This deliberate exercise in visual deprivation not only illustrated the notion of mortality in a novel way, it also, by way of extreme contrast, magnified the psychological impact of the accompanying “Sky” series which appeared naked on adjacent walls in each of the two shows, one at Sac State, the other at the Pence Gallery in Davis. Unlike the “Earth” pictures which emphasized disintegration, the “Sky” paintings brought to mind an imaginary universe teeming with oceanic and celestial life. And while the influences of Terry Winters and her mentor, Joan Moment, hover, it’s Louie’s innovations that hold sway. 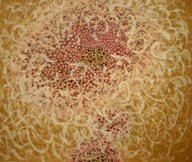 Each painting in this series is comprised of interlocking circles that at a distance define recognizable floral shapes composed of forms that look more like cells than seed pods. Close up, they exert an entirely different effect, plunging viewers into labyrinthine pictorial space that vibrates with op-like intensity despite the fact that each circle is hand-painted. Using flowers as a metaphor for the temporal nature of life is certainly not a new idea – Mondrian and Morris Graves exercised it famously. Louie, with her otherworldly imagery, both revealed and obscured, forges her own path. The result is a vision that feels fresh, if not dizzyingly invigorating.